We can’t be home all the time and in truth we probably don’t want to be – that would severely limit how we live our life. So how can you head out the door secure in the knowledge that your home security is as secure as possible? Well as it happens there are all kinds of smart technologies these days that can help you burglar proof your front door and your entire home for that matter. The best part is it doesn’t have to cost you a small fortune as many of these solutions are quite affordable and widely available. Here are 10 smart home technologies that you can use to secure your home. Perhaps my personal favorite is the doorbell camera and if you’re not familiar with these they look very much like a normal doorbell with the exception that there’s a small camera lens located at the bottom. A great example is the Ring Wi-Fi Enabled Video Doorbell. This handy little gadget lets you see and talk to any visitor hitting your front doorstep over your Wi-Fi network whether you’re sitting in your kitchen or on the other side of town. If that’s not impressive enough how about the fact that this piece of tech actually has night vision built in as well – it might not be quite as much fun as a game of Call of Duty where you get to be a special ops soldier using your night vision to complete a mission, but it’s pretty cool just the same. It’s also a lot more practical of course. 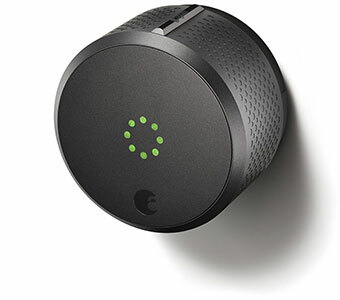 How does a smart lock sound that lets you forget about traditional keys and use your smart phone to access your home? That technology exists today and a great example of that is the August Smart Lock. If you use this little device to replace your old fashion key lock you can actually sync it with your smart phone so that any time you leave the house with your smart phone in your pocket it will automatically lock the door – when you return home the lock detects your smart phone and unlocks the door as well. That might sound great, but what about allowing others to access your home? As the person in control of the lock you can use a smart phone app to control who can enter your home and when. There’s no need to leave a key hidden under the matt (which is the first place a burglar will look) for your kid coming home from school, or the neighbor that’s feeding your fish while you’re on vacation. With this little device you can simply allow them access via their own smart phone and you don’t have to worry about the wrong person finding your hidden key. The August company has released a series of products which work seamlessly together to secure you home, as well as some other home security tips and tricks. Sometimes there’s no need for expensive high-tech gadgets – just the perception that they exist. Let’s face it, a burglar’s looking for the easiest mark and as soon as they see any kind of home security they’re likely to move on to the next home. A simple and affordable option for protecting your front door is the use of false security cameras. These are fake cameras that look like the real thing, but don’t require expensive monitoring or computer hardware to keep track of things. 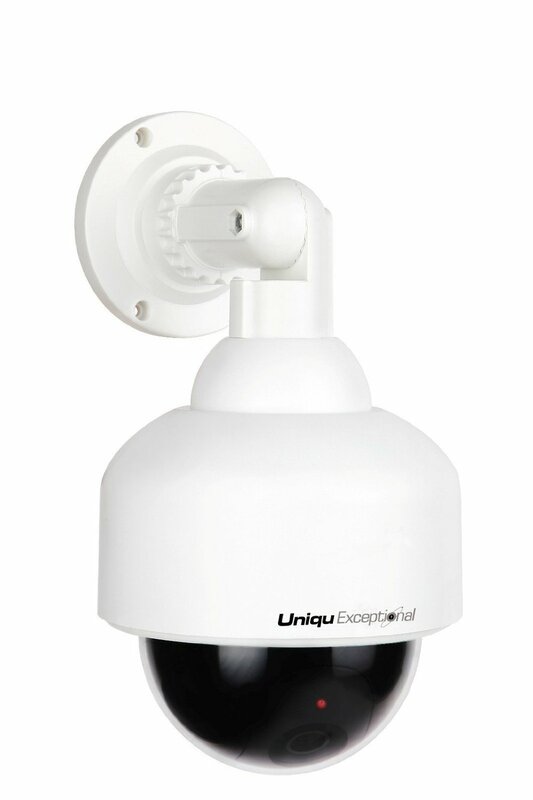 The UniqueExceptional UDC6 fake security camera is a very popular choice. It features fake infrared night vision LED’s which look like the real thing. If the burglars attempting to break into your home are anything like those famous villains in the home alone series of movies this should be enough to deter them. If you’re not comfortable with the idea of fake security cameras and you’re okay with spending a little bit of extra money there’s plenty of choice when it comes to real security cameras. These days security cameras come in all different shapes and sizes and most of them can be tied into your smart phone or tablet so that you can personally monitor your front door. If you’re willing to spend even more money you may want to consider installing security cameras that are connected to a security service that monitors them for you. 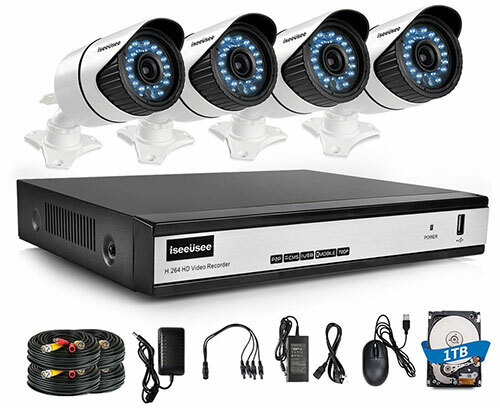 If you prefer to do the monitoring yourself you might want to consider a system such as the ISEEUSEE 4 Channel 720P HD DVR system. This baby comes with a 1 TB hard drive to store all the video that the cameras collect from monitoring your front door. The system might not protect you from the Terminator if you’re John Connor, but it will easily protect you from most common criminals. 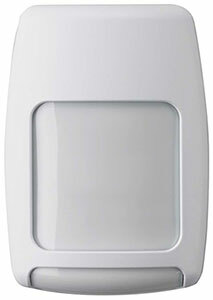 Switching back to a less expensive option, another great choice is the use of smart LED lighting. These can be placed near your front door and can quickly and inexpensively give the impression that someone is home. 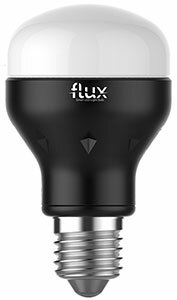 The Flux Wi-Fi smart phone controlled dimmable bulb is one of the smartest light bulbs you’re ever likely to come across. This bulb can be controlled by your smart phone connected through your Wi-Fi network from pretty much anywhere. As an added bonus it’s also a multicolored bulb so you can change the lighting color to reflect your mood or maybe put on a little light show for your favorite uncle that still has that lava lamp tucked away in his bedroom. No matter what type of security you put in place there’s bound to be one or two bold burglars that won’t be easily deterred. If you’ve got a burglar that’s not scared off by your security camera or any warning signs you might have posted in your windows then you might want to try a glass break sensor. This device does exactly what it sounds like it does – it sets off an alarm when any glass breaks, so if you position one of these near your front door you might be able to scare off that burglar before he crosses the plane of your home. There are a ton of different options on the market when it comes to glass break sensors such as the Honeywell 5853 glass break detector. This is a simple little device with a 25 foot range that’s easily mounted on any wall. You can easily mount this on the wall near your front door and it’s battery-powered so you don’t have to have a wall plug nearby as a power source. Honeywell have consistently come out with intelligent solutions for the home and home security in general. Their smart products work with the majority of smart home hubs. Some of us aren’t satisfied with basic solutions – we like to go all out and make sure we’re covering all of our bases. Everyone knows someone like this and a great example would be Tim the tool man Taylor if you remember watching him on that classic series Home Improvement – in Tim’s mind bigger was always better! If you want an all-in-one security solution you’ve got a lot to choose from. The Canary All-in-One security device is one that has a ton of great features that will help you to secure your home. It features a security camera with a wide-angle lens, night vision, motion activated recording, instant access to the local authorities, and it also has features built-in to monitor your home’s health as well. That’s right, it not only gives you a great security solution it can also monitor your air quality and the temperature in your home – talk about handy! 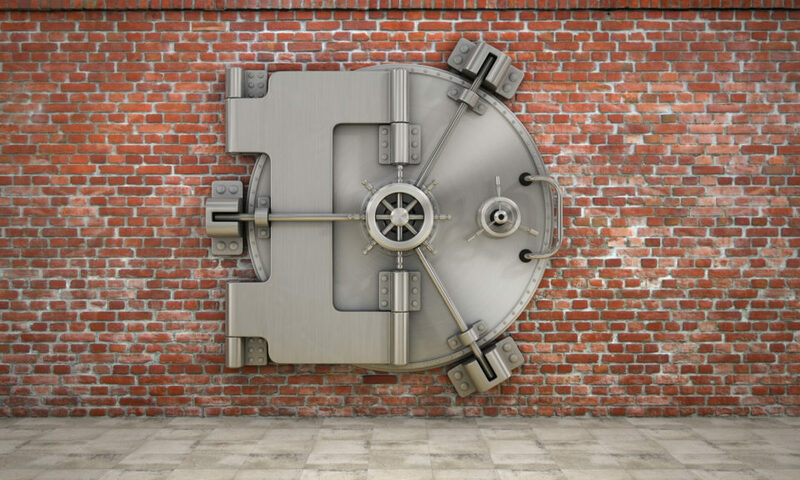 My wife isn’t thrilled with the idea of having all kinds of security features on our front doorstep – it really clashes with the outside decor I’m told. Fortunately, making your home secure doesn’t necessarily require the installation of security cameras that stick out like a sore thumb – there are plenty of options with a more subtle profile. 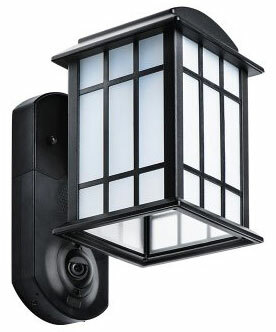 I’m definitely a fan of a new breed of security camera that incorporates a built-in security camera into an outdoor light fixture. Take the Kuna Smart Home Security Outdoor Light and Camera – this handy piece of equipment features a classic looking outdoor light fixture which also happens to have a security camera subtly incorporated into its wall mount. If you look closely you’ll notice it there, but it certainly doesn’t stand out. There is nothing like turning on the bright lights to scare burglar way and that’s why floodlights are something you should definitely consider. 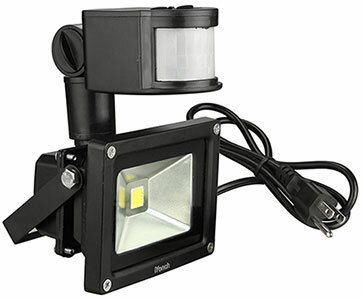 The iYonch 10W LED motion sensor floodlight is ideal for simple home security. You simply place one of these near your front door and anytime a person, or even an animal, crosses its path it automatically turns on flooding the area with light and there’s a good chance that burglar scoping out your place will turn tail and run. The final piece of smart technology I think deserves to make this list is perhaps the simplest – it’s just a little doorstop. If you remember your days in grade school you probably remember a lot of class room doors with that simple rubber doorstop to keep the door open and let a little air flow in on hot summer days and these really don’t look a lot different. GE Personal Security Door Stop Alarm has one on the market that you may want to consider and while it’s not made of rubber it looks very much like any other doorstop. The idea behind a doorstop alarm is that as soon as pressure is put on the doorstop it automatically sets off an alarm. It doesn’t need to be wired to anything and you don’t need to connect it to your smart phone – you simply slip it under your door and as soon as anyone puts pressure on it by entering through your front door the alarm will automatically go off. Chances are it will scare off most burglars. There you have it, that’s our list – just a few simple tools you can use to make your home more secure. A burglar may not be inclined to break into your home through the front door, but they’re bound to look at the front of your home for signs that anyone’s home. When they see those security features in place they’ll hit the road as fast as I can. I like that you said that we can’t be home all the time. Knowing this, security doors aren’t really bad ideas if you have things to protect. It might be a good idea to take safety precautions when you are unsure about safety. I like that you mentioned that using smart LED lighting can ward away burglars. Controlling your lights from your smart phone could really help. There has been a few burglaries in our area recently, and my wife and I are trying to find the right ways to improve our security. I will keep these tips in mind!